MARQUETTE — Students at Northern Michigan University were given a chance to help a Paralympic athlete become more of a threat to her competition. It seems like even they were up for the challenge. Paralympic Athlete Kelly Allen was born without her left femur, patella and fibula, along with an underdeveloped hip. Despite the fact that Sprint Kayaking is a sitting sport, using your legs is paramount in helping give leverage and generate power. Without the proper bone structure, Allen will have a tougher time propelling the boat, not only with power, but direction as well. Students from NMU’s Advanced Mechanical Kinesiology class had a plan to fix it. 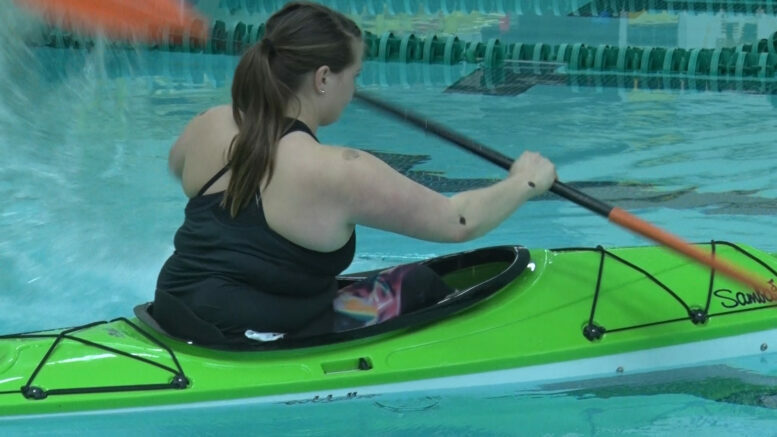 “The students basically were tasked with coming up with a prosthetic design to help her have better performance in the boat, but to also come up with some assessments to allow us to investigate whether or not this prosthetic actually helps her improve her performance,” said Sarah Clarke, assistant professor in Exercise Science at NMU. The prosthetic is used to help Allen create more leverage, allowing her to paddle harder on one side than she’s used to. In turn, this will help her paddle in a straight line, and get to her destination faster. Her sport is, after all, a sprint. Allen qualified for and eventually raced in the 2016 paralympic games in Rio. She took eighth in the final, but only saw the finish as motivation to train harder for the upcoming 2020 games in Tokyo. This new attachment will up her game dramatically. The chance to see their work come to fruition is unlike any other, and the students don’t take for granted the opportunity the class has presented. “Just the opportunity to work with a paralympian like Kelly, that’s not something that just happens every day,” said Student Ashley VanSumeren. “In my six–and–a–half years in school I’ve never been in a class that’s been so practically applied to the real world,” said Student Olivia Perrin. Despite a short time slot, the students were able to design and create the attachment in a matter of weeks. It seems that their new gadget might just work. From here, Allen will return to Oklahoma, where she can test the prosthetic with her boat. With the proper tools, training, and encouragement, that path to a gold medal might not be so long.